Ruffled pasta, chopped spinach, feta cheese, fresh tomatoes and cucumbers, and a Greek yogurt dressing! 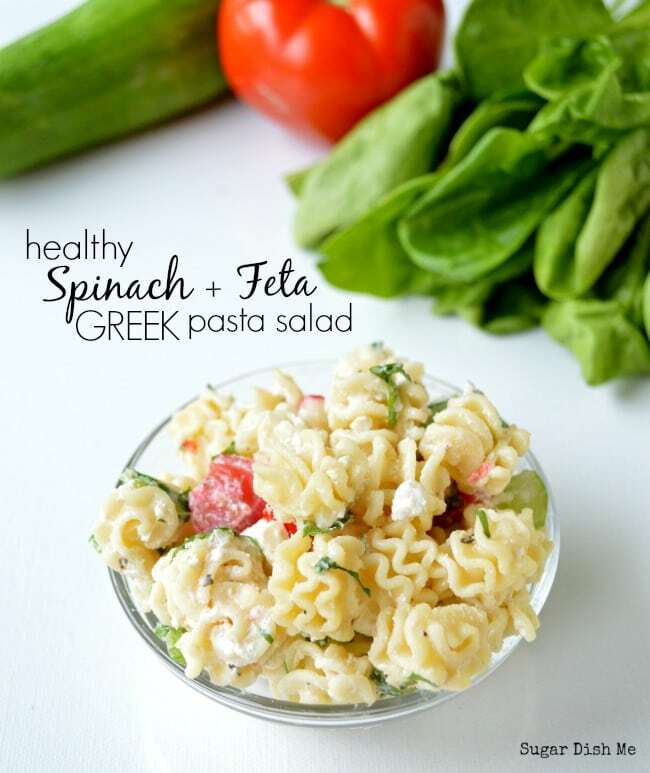 This Healthy Spinach and Feta Greek Pasta Salad makes a great side dish or lunch-on-the-go! Add grilled chicken for a quick meal. I have THE HARDEST time with side dishes for dinner. I don’t know why it trips me up so often, but it does! 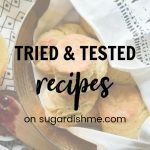 So then I decided to really try to focus on excellent side dishes, and I did pretty well! Until I realized they were all pasta salads. 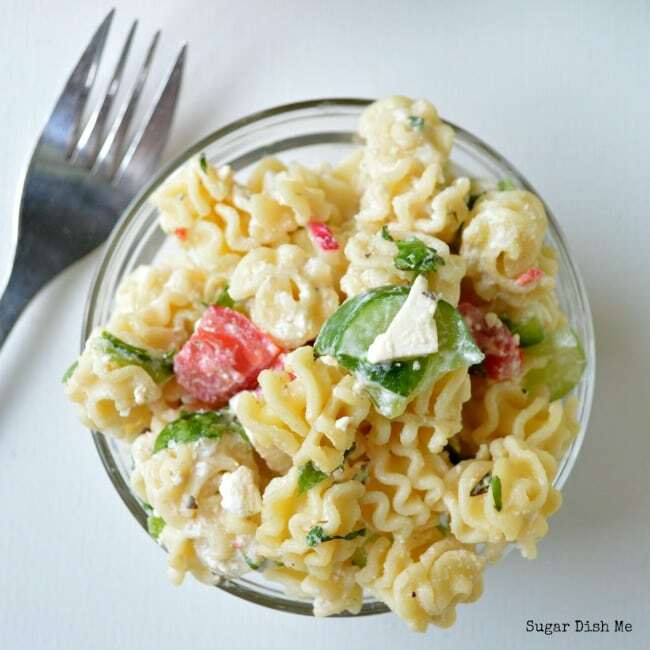 The good news is that pasta salad is awesome, and THIS Healthy Spinach and Feta Greek Pasta Salad is full of good stuff. I’ve been having a pretty good time this summer using Greek yogurt in place of all the mayonnaise in things. 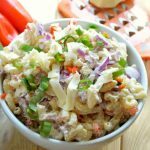 It works especially well with this particular pasta salad, and I really love the fresh tang it adds. And I just realized I wrote ‘good’ like 6 times. Way to choose some adjectives!!! I’ve never really been a lover of mayo anyway, so finding a yogurt alternative that I love has been a kitchen game-changer for me. If Greek yogurt is not a staple in your kitchen by now, it will be after you try this recipe. If you aren’t sure which brand to try, I highly recommend Cabot Greek yogurt. It’s my favorite (and I swear they don’t pay me to say that!). This side dish comes together really easily while you prepare other things. 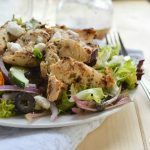 We served ours with grilled chicken and it was a totally light, quick, 30-minute meal. Ruffled pasta, cucumbers, tomatoes, and chopped spinach tossed in a creamy Greek yogurt dressing with Feta cheese. Cook the pasta according to package instructions. Drain and rinse with cold water. 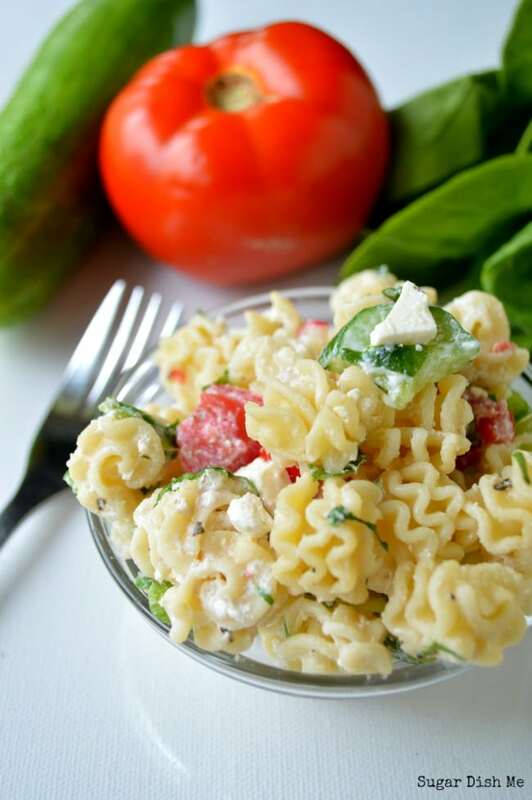 In a large bowl toss the pasta with the spinach, tomatoes, cucumbers, and feta. 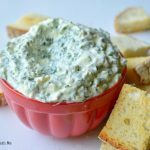 In a smaller bowl whisk together the Greek yogurt, olive oil, lemon juice, garlic, and oregano until smooth. If you feel like your dressing is too heavy you can add additional olive oil, lemon juice, and vinegar to reach your desired consistency. I made my dressing pretty thick - it clings to the ruffled pasta nicely. Toss the dressing with the pasta and vegetables, add salt and pepper to taste, and serve. What are your favorite side dishes? I clearly could use some help. That looks amazing! I am going to try it tomorrow.